Nothing can come between food and Bengalis, no not even the sweltering Indian summer. We will eat light juicy vegetable based curries for days to keep our system cool but once there is a hint of any festivities we will jump on the opportunity to make a luxurious meal for ourselves. Most of them might not come across as summer friendly. This just happened in my family. Ever since I have come here at Maa’s she is feeding us lovely homecooked meals. But now as Jamai sashti is around the corner, her planning knows no boundaries. The real factors like summer, heat, the mercury soaring sky high had all just disappeared from her life. When I requested for some light dishes, she counter attacked by saying we cant treat our son in law with everyday meals and if the heat seems unbearable we will install another a/c in the dining room. Huh! Who can argue with that? So it’s going to be a lavish fish based Bengali spread on Sunday for their fish loving jamai. 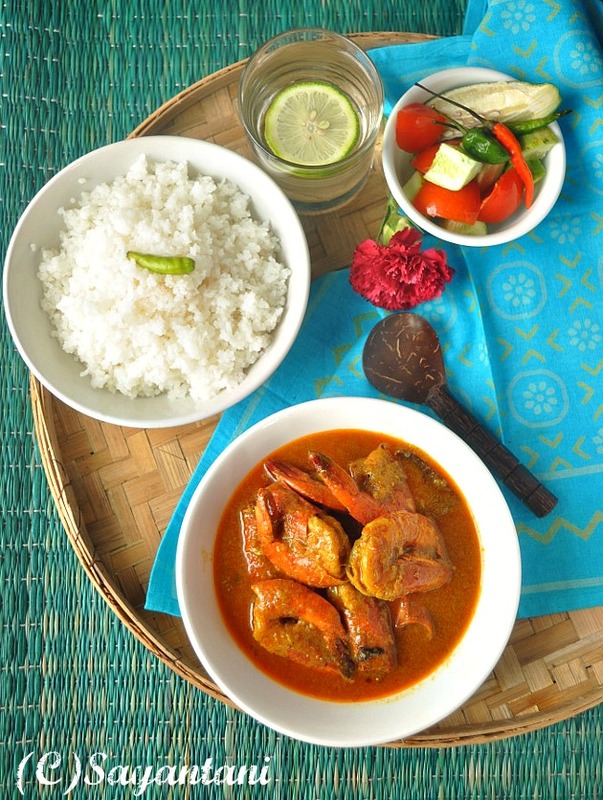 I can’t argue but what I can do is to share the recipe for one of Bengal’s most famous prawn dish, Chingri Macher Malaikari, Big prawns in a rich coconut cream based gravy. If you have ever tasted it you would know how delicious this curry is. The velvety gravy is the highlight of this dish, which makes it finger licking good. 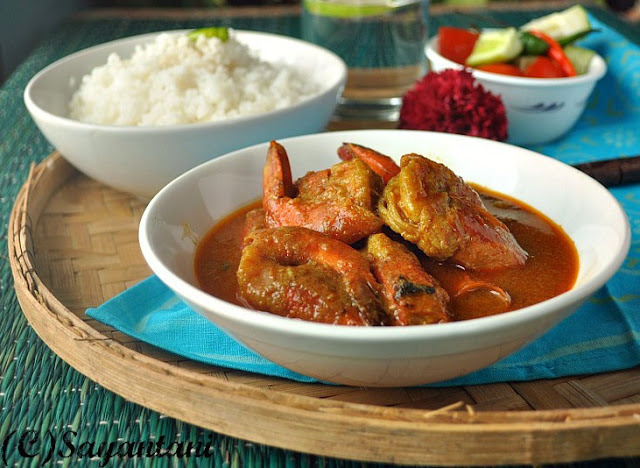 But before I share the recipe let me warn you this is not your everyday prawn dish, better to reserve this for some special occasions to serve along with some basmati rice and dry curries. Sometimes back I saw some chef on NDTV telling that this is the only Bengali dish which is cooked in coconut cream. Which is not true. We have an array of dishes where coconut milk and freshly scraped coconut is used but no wonder malaikari enjoys the iconic status in the lot. 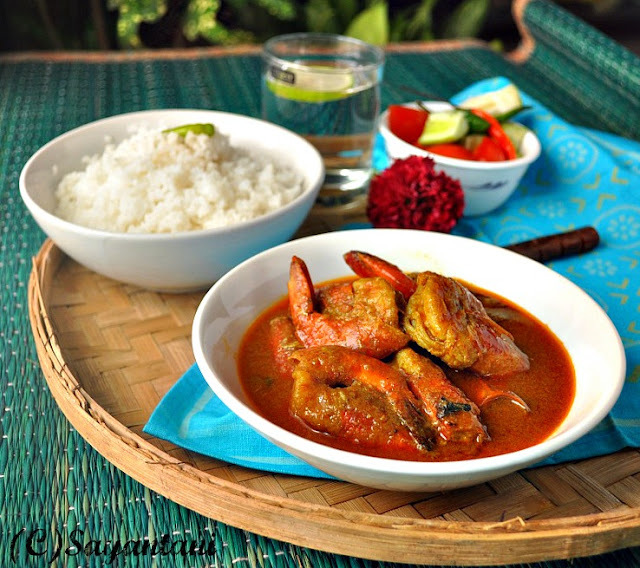 Apart from its taste the overpriced prawns make it a prized dish in any Bengali spread. There was a time when we had to scrape and extract fresh milk from the coconut. I hated that tedious process but now rich coconut creams are available in tetra packs to fill our lives with more malaikari. Though its another fact that puritans say the packed juices don’t taste as good as the fresh ones. I don’t find much difference and it eases my job so much that I rather would like to ignore such comments. If you ask a Bengali what classifies a good Chingri macher malaikari the answer would be its rich yet velvety texture of the gravy. It should be spicy but smooth, thick but velvety. 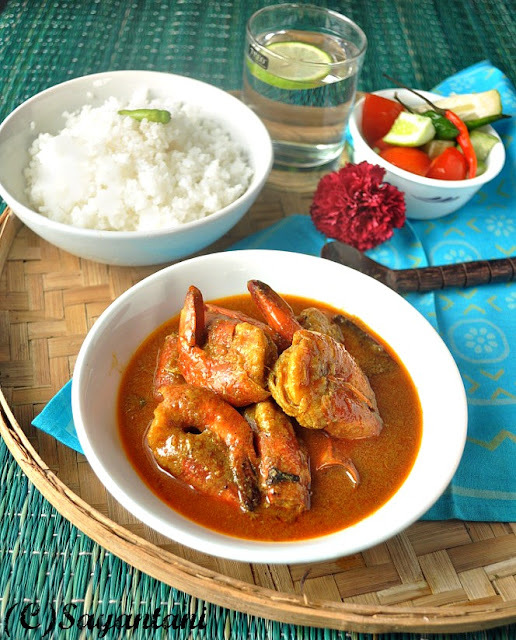 We generally prefer to cook this dish with medium big size pieces of prawns as that soaks up the spices well. If you plan to cook with jumbo prawns then ensure to slit or poke the prawns with a fork at several places. For a good malaikari please see the points under notes. Wash the prawns and smear it with salt and turmeric (if using). Keep it aside for 10 minutes. Now take a handful of the onion paste and over a big bowl start squeezing it. The juice and fine pastes will come through your fingers. Use the coarse parts in your hands for other curries. repeat with the rest of the pastes. You should have 5-6 tbsp of smooth watery spice paste. Keep onion paste and ginger garlic paste separate. Trust me its not a big job but ensures a wonderful texture for the gravy. Now heat the pan with a tbsp of oil. Fry the prawns for a minute or till they turn pink. take out the prawns along with the oil. Keep aside. Pour the rest of the oil in the pan and when its hot add lightly crushed cardamom, cinnamon, coves and the whole bay leaf. Once they start to splutter add the onion paste. On low flame fry the spice with little salt for approx. 4-5 minutes or till you see oil start to appear at the sides. Then add the ginger garlic paste and again fry for a couple of minutes till the raw smell is gone. Now add chili powder and mix. After a minute or so add the coconut cream and same amount of water. I used the empty pack to measure the amount of water. Mix and check the seasoning. Add 2-3 slited green chilies. Let it come to a boil. Depending on the amount of gravy you want cook and thicken it. I cooked for 3-4 minutes. Now add the fried prawns along with the oil. Mix and cover. Check the seasoning for one more final time and adjust the salt and chili. Cook for 5 minutes. Switch off the flame. Sprinkle the garam masala and cover.let it stand for 5 minutes before serving. The recipe that I shared here is my family recipe, which we more or less follow. I made it this way for this particular post, which I made for some of my guests. While cooking for family for weekend I make a fine paste of the spices and use it the same way. Adjust the amount of water depending on how much and how thick a gravy you want in the final dish. Same with chilies add more or less as per your taste. Many people don’t add turmeric in malaikari. It totally depends on you. Chingri. chinri, chingri mach. chabra chingri recipe, prawn recipe, indian prawn recipes, bengali prawn recipe, bengali shrimp recipe, how to cook bengali style prawn malaikari, prawn malaikari recipes, chingri macher malaikari recipe, indian prawn curry recipe, prawn cooked in coconut cream, coconut milk prawn recipes, spicy prawn dish, best prawn recipe, indian prawn side dish, trawn dish to go with rice, how to cook prawn indian way, prawin in thick coconut milk gravy, east indian shrimp recipe, shrimp with onion garlic, shrimp in onion gravy, prawn in thick spicy curry, bangladeshi prawn recipe, chingri bhuna recipe, how to chingra.chingri recipe, chingri curry. 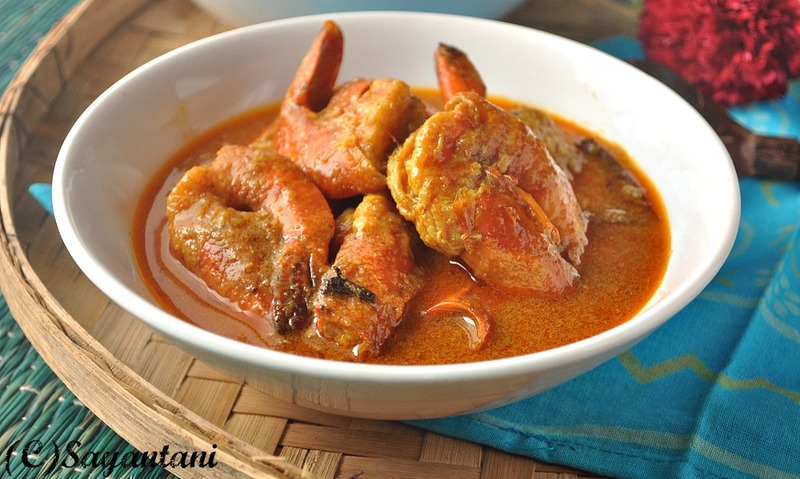 chingri malaikari, chingri malai, bengali chingri recipe, bengali recipe, chingri macher recipe,prawn curry, prawn recipe, prawn recipes, prawn curry recipes, jhinga recipe, jhinga masala, jhinga curry. Looks utterly delicious, like prawns and coconut! So well presented. Looks great. Wat a wonderful spread, seriously ur prawn gravy makes me hungry. That is one delicious luxurious shrimp curry and no one can resist that. As regarding the packed coconut milk I am more concerned about the preservatives and additives that go in to keep the coconut milk from spoiling. this looks simply great!!!! !your pics are very good....this recipe is yum!!!!!!! Look at the way you have served the dish...presentation is too good:)It's lovely to know you are enjoying your stay at mother's place. My son just adores prawns...will make this for him someday!! How are you feeling now? Any better? Eta amar shobche favourite dish .. and my Mom makes it the best way. Super spicy and it looks so gorgeous red. Mine never looks like her .. but i still love it! Nice presentation, prawn gravy looks so delicious and flavorful. Hope you are having an awesome time at ur mom's place ....... The curry looks delectable and the presentation is awesome. kothay jeno research cholchhe ki kore computer moniter e 'touch & feel' utility bosano jay..ei sob sundor sundor rannar chobi dekle 'smell & taste' utility tao niye bhabna chinta kora uchit bole mone hoy..huh! sotti e fatiye gorom. tao erom chingri dekhlei hat dhuye bose porte mon kore..but kakor jamai na holeo je kauke ador kore khawano jay seta onekei bhabe na..kotodin dab chingri khaina.. :( tar upor puro ghoti to..chingrir upor ekta alada eea achhe..
tis s wonderful..wit coconut gravy yum yum it luks.. This sounds so delicious. I'm always looking for new ways to enjoy prawns, too. Thank you for sharing! I have recently dived into the world of sea food, and this is a brilliant to look at and am sure to taste as well..very very nice. I made this it was very good but could not get the reddish colour........can you help me out with it...? @Amrita, The chili powder that I use is of very good quality (from Rajasthan) and always fry the powder with the spices. That could be a reason.you can try using kashmiri chili powder for that colour. or Everest Tikhalal is very good. try using that.